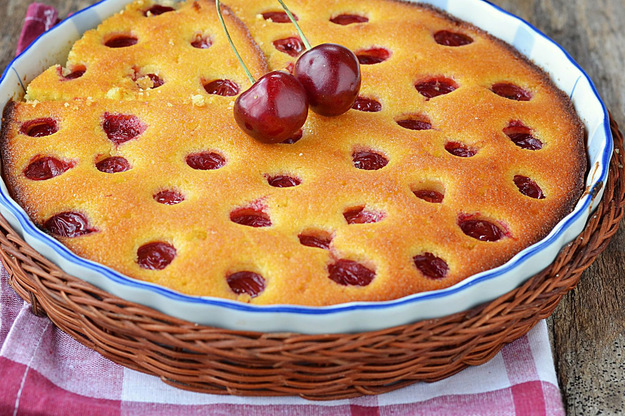 Cherry pie – a wonderful treat for the whole family. Sweet sponge cake, prepared according to this recipe, it turns out light and airy. And acidity, which give cherries give the cake an amazing taste. The first thing you need to prepare the stuffing. Cherries wash and remove the seeds. Optionally, the cherry, you can add some berries cherries (rinsed to take the bones out). If fresh cherries at hand was not, you can use that are sold in the store, frozen berries. To use these berries, they must be thawed and washed before cooking. You need to consider that the weight of frozen berries more than fresh, so they need to take more. Pour the prepared berries into a form that you need to pick up soon, because it will be baked pie. The baking dish can be any shape as desired. On top of the berries and cover with sugar. Next, prepare the dough for the pie. While the dough is prepared, and the berries have time to absorb the sugar and will allocate the syrup. Fast movements beat the eggs with sugar, pour, spoon of salt and baking powder. If baking powder not, to repay soda (half a teaspoon) of vinegar and add to mixture. In a separate bowl mix the sifted flour and yogurt. Then mix both mixtures in one bowl and mix well. The resulting dough pour vegetable oil, this will allow the cake to stick to the walls of the mold for baking. If you want to give the cake flavor, you can add in the dough is a little vanilla. The resulting mixture is stirred, its consistency should be like batter for pancakes. Next, pour the dough on a sugared cherries and mix everything carefully. Put the pie in the oven. Bake the dish until the dough will not rise and the cake will not become Golden. Decorate pie with fresh berries.